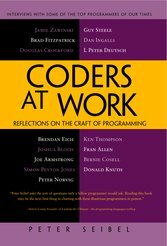 相當值得一讀的一本書, 是作者和一些出名的 coder 的對談錄, 內容當然都和 programming 相關. 除了一般對話, 有幾條固定問題作者會問到, 用甚麼 development tools, 遇到過最頭痛的 bug, 如何 debug, 對某 language 的看法, programming language 的前景發展等. 我最愛 Joe Armstrong 一章, 看後啟發良多. 讀完後有一個問題經常浮現, 究竟 programming 應是如何? 現在所謂的 development 大多用 external 的 library/framework/service, 時間花在看 doc, 找 api, copy & paste (code and idea). 公司 project 當然要選擇又快又好的方法, 無可厚非. 自己時間則希望可以嘗試寫 functional programming language, 認真看看 algorithm/data structure, 研究一下平時使用的 library/framework 的 source code. Programming should be fun.